Of course, you can use the slow cooker function or cooking button on your electric pressure cooker (Instant Pot). But here’s the thing – it’s a pressure cooker. 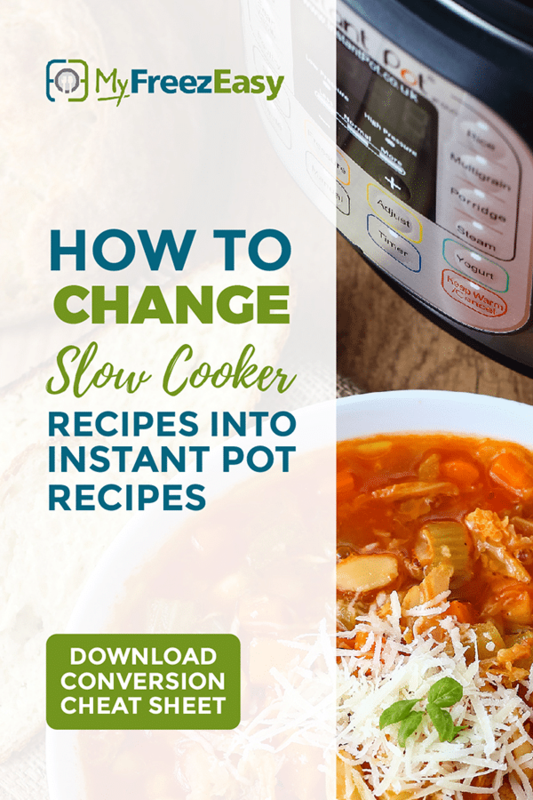 Use the slow cooker to slow cook. Use the pressure cooker to pressure cook. Pretty straightforward – but why? Well, slow cookers are (usually) perfectly calibrated to cook for longer periods of time. And they slow cook and soften food in a perfect slow cooker-y kind of way. Please note: if your slow cooker “runs hot” and has a tendency to dry out food or overcook food, it’s time for a new one. This slow cooker is our top recommendation. Electric pressure cookers, most commonly known as the Instant Pot, are designed and calibrated to perfectly pressure cook foods. Here is our favorite Instant Pot model. And because of that, I don’t use the slow cook function on the electric pressure cooker/Instant Pot. 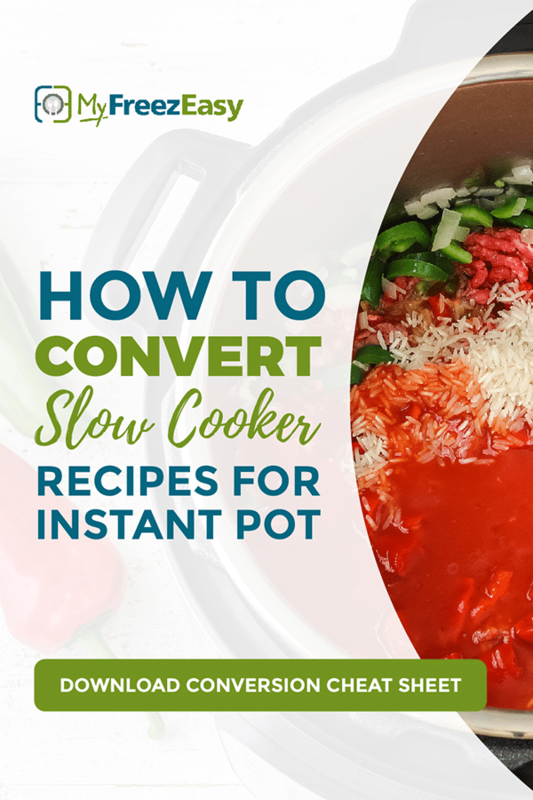 Instead, I convert recipes using the following modifications and conversions that can be easily made for slow cooker recipes…to turn them into Instant Pot recipes…using the pressure cooking functions. Let’s get to it, shall we?! 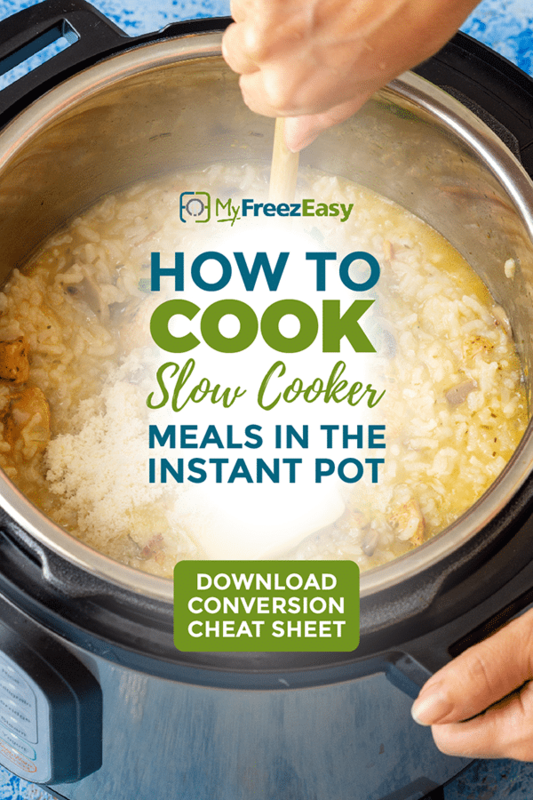 Below is a list of recommended conversions and time ranges for converting slow cooker meals into Instant Pot meals. Ground Beef : You can brown the ground beef in the Instant Pot insert or in a skillet, and then cook based on recommended times below. Beef Roast: We recommend cooking the roast with the sauce until cooked to your liking, and then adding the veggies and pressure cooking another couple minutes to cook the veggies. Cooking the veggies for the entire length of the pressure cooking will turn them to mush. Also note, the cooking times for roasts can vary widely, depending most on how thick the meat is. Pork Roast: Use the same recommendations as the beef roast. Seafood – Salmon or Cod: These just take a few minutes and please read the notes on the chart carefully! Pasta: Pasta can be cooked in the Instant Pot with some liquid and other ingredients, vs. being added at the end of a slow cooking cycle. You can find our favorite Instant Pot pasta recipes here. 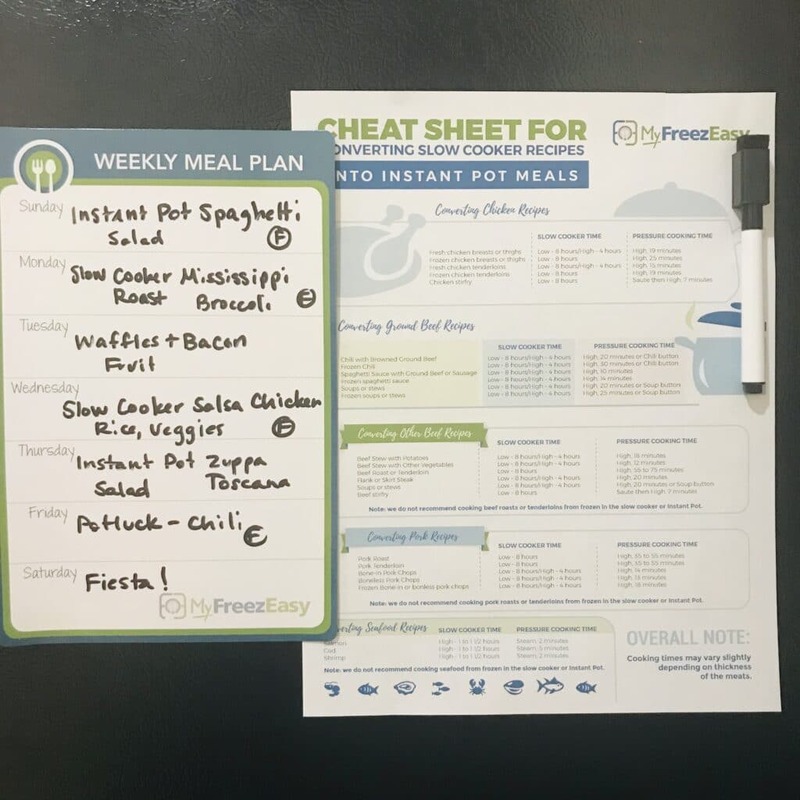 I realize there are many options and methods, but these are the most popular and easiest weeknight dinner types of meals. Be sure to check out our list of amazing Freezer Cooking Hacks before you bounce to the next place on the interwebz! Tap or click here to see ALL OUR BEST HACKS!